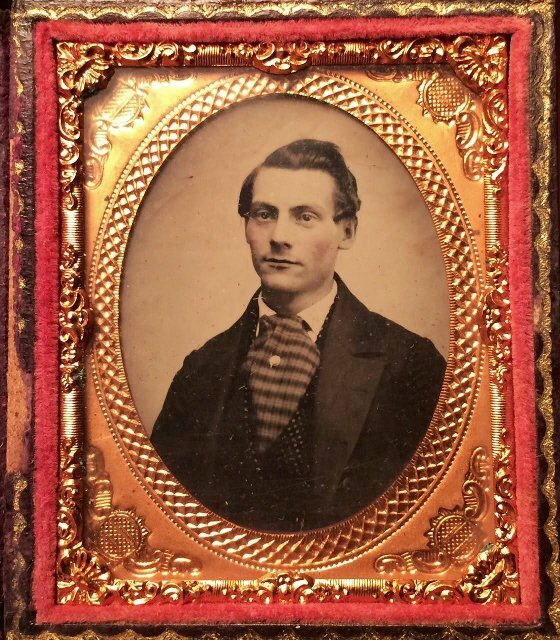 From Hartford, he was a 29 year old carpenter when he enlisted in Company A, 8th Connecticut Infantry. He mustered into service as Corporal on 25 September 1861. He was killed in action on 17 September 1862 by the concussion of a 12-pound shot. He died on the Henry Rohrbach farm. Death and burial information from Banks1. Service dates from Ingersoll2. His age and occupation also found in the Catalogue of the 6th, 7th, 8th, 9th, and 10th Regiments of Infantry ... Connecticut Volunteers, 1861 (Hartford: CT Adjutant-General, 1862). The photograph here from a fine cased image kindly provided by John Banks from his collection.